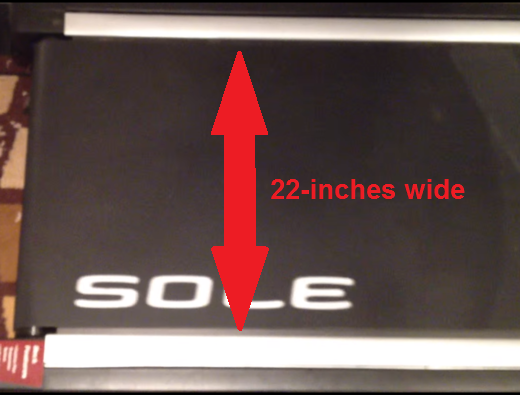 Sole is known for making quality, commercial-grade treadmills; in fact, many major hotel chains outfit their fitness centers with Sole treadmills because of their durability, now, by popular request I give you this updated and expanded Sole S77 treadmill review! The Sole S77 treadmill has been one of the company’s most-popular home machines for years because it exhibits the same quality at a more affordable price. Is it the perfect treadmill? No, but it’s pretty darn good. This Sole model is built to last with a heavy-duty welded steel chassis, and features a 4.0 continuous duty HP motor which is more powerful yet much quieter than most competitors (as mentioned in many online Sole S77 reviews and **as seen in the product pictures**). Largest motor in a treadmill under $2000. – Sole S77 review by Treadmill Dr. The two balanced flywheels are also made from steel (and then zinc-coated), and a rack-and-pinion system is used to drive the machine. The textured belt is made from layers of rubber, PVC and nylon which provide strength while preventing the belt from stretching too much and allowing it to glide smoothly over the deck. The end result is a walking or running experience that is secure and free of vibration. The deck on this product is probably the largest you’ll ever see. The running surface is 22-inches wide and 60-inches long and it can even accommodate more than one person at a time. 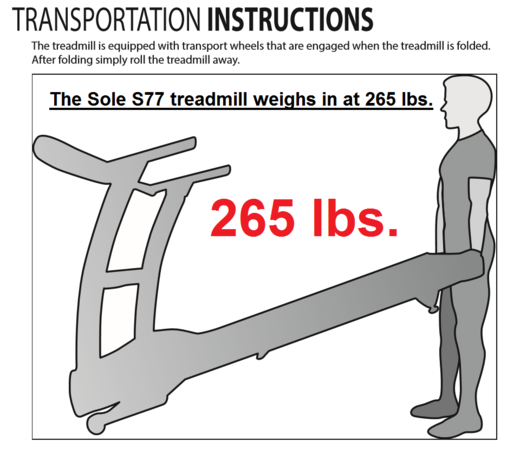 It’s the largest that Sole makes; when you combine this size with the treadmill’s durable construction, it’s easy to understand how the machine’s maximum user weight is an impressive 400 pounds. The S77 doesn’t blow you away when you first get on, since the start speed is a sedate 0.5 mph. But it can reach the 12 mph speed you’re accustomed to on a gym-quality machine. The incline range is quite good, from 0° to 15°, and there are ten different programs (six standard, two custom, two heart rate) to choose from. There are grip and chest monitor options, which Sole claims are 99% accurate. There are also built-in speakers allowing you to plug in an iPod or other MP3 player and listen to music. The display on this treadmill is a bright 9-inch LED display which continuously shows speed, incline, distance traveled, elapsed time, pulse, pace and calories burned. It can also show a peak and valley graph and ¼ mile track for some of the included programs. The S77 comes with an outstanding warranty. The motor, frame and deck are covered for life, parts are covered for five years and in-home service is free for two years. The price of this treadmill is in the $2500 range. There’s a lot to recommend the Sole S77 treadmill. Obviously Sole Fitness feels confident about the machine’s durability, or else they wouldn’t offer such a sweeping warranty. The relatively quiet operation of the treadmill (you have to be realistic – all treadmills are somewhat noisy) is also a big plus. Then, there’s the most important consideration of any fitness equipment: how it works. The S77 passes this test with flying colors. Thanks in large part to the previously described design of the flywheels and belt, the experience of running or walking on the track is extremely comfortable and the usual “aching feet” issue doesn’t come into play over long sessions. Sole calls the technology “CushionFlex” and claims that it means 40% less joint impact than in road running; we can’t quantify it, but it definitely makes a big difference (even NASA says so). Size isn’t everything – unless you need it. The wider track is a nice feature, but it’s critical if you’re an XXL (or XXXL) workout warrior. In that case, the extra two inches of width over what you find on most high-end treadmills, and the ability to bear up to 400 pounds, are enormous advantages (no pun intended). The track is also longer than average, which means it suits the stride of tall runners well. The LCD display is very easy to read and shows most of the information you’d want to see. But perhaps the coolest feature on the display is Sole’s integrated message board. It “talks” you through the details of a workout as you set it up, right on the monitor, so you don’t have to keep looking back at the user’s manual or an online guide. When you’re finished, the message board shows you a recap of the workout you’ve just done. Sturdiness and size often come at a price; in the case of this treadmill, the price is the S77’s weight and footprint. WARNING: The treadmill weighs nearly 300 pounds, it’s a bear to move around and it requires more than the average amount of room in your basement or home gym. Once the machine is assembled and you’re enjoying it, size is not an issue. But it’s definitely something to consider before making a purchase decision. And while we’re on the subject of size, one person’s “pro” is another’s “con.” The oversized desk of this Sole model is great for most users, but may be a bit too large if you’re an extremely small runner. Be sure to take that into consideration before buying. The display on the S77 is terrific, as far as it goes. 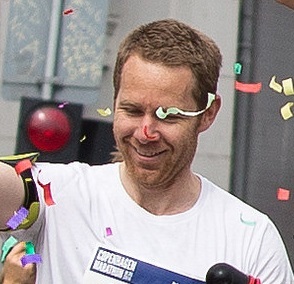 However, many runners who like challenges will find that the preset programs are too few to satisfy them. 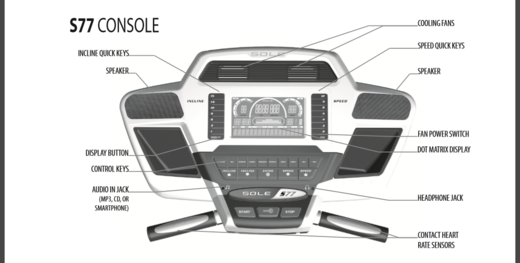 There are no preset distance programs included with this treadmill, and the console does not have the capacity to connect to iFit or other programs which let you access or download thousands of different running courses (as pointed out in the Sole S77 review by Consumer Reports). You also don’t have the ability to download the data from S77 workouts to an external program for storage or analysis; most competitors let you connect to an app for this purpose. The Sole S77 is a commercial-quality treadmill which would be an outstanding addition to nearly any home gym which has the space for it, and it’s priced quite reasonably for this level of equipment. Just don’t forget, it’s a non-folding treadmill. It’s also – by far – the best home treadmill we’ve seen for very large runners. We recommend it strongly, and would only hesitate if you’re very small in build, or if the lack of external connectivity (to import foreign courses or export workout data) is one of your major criteria in selecting a treadmill. Head over to Sole Fitness for details about the current Sole S77 treadmill sale, warranty and free shipping. 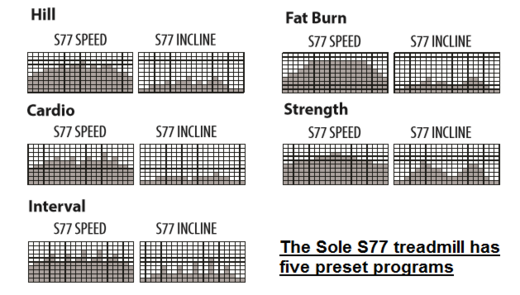 Finally, if you feel there is something I neglected this Sole S77 treadmil review, let me know!